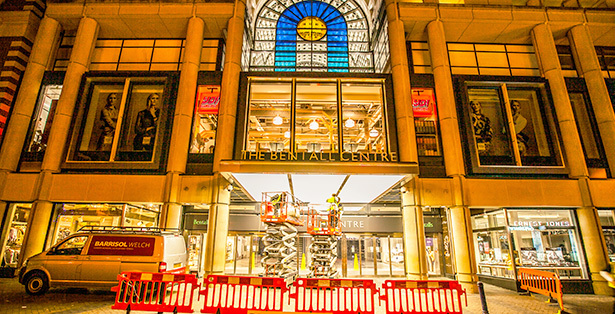 The Bentall Centre, Kingston Upon Thames’ flagship shopping establishment is currently undergoing ongoing renovation and improvements work to maintain its status as the local must go to building for all your shopping needs. Part of this works includes extensive lighting improvements to its main entrance for which Welch Services Group designed, supplied and installed low energy LED facade lighting. As you can see from the video, the installation of the lighting and stretch diffuser is very quick, much more time is spent on prepping the area and any lighting work required. An initial clear sheet is installed to minimise the effect of dust creating shadows after long term installation. This reduces the maintenance requirements of the installation. The Barrisol stretch ceiling disperses the installed LED lighting very evenly and what you are left with is a bright, white, warm light to welcome and entice the local populous into the building in these cold winter nights.